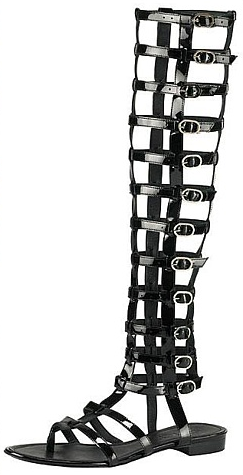 So I saw these gladiator sandals on Stuart Weitzman's instagram when I watched the campaign that Kate Moss was ambassador of, and I fell in love with it instantly (might have drooled here and there). It actually reminded me of the summer trend 5 years ago. I remember still being in high school when my fashion-forward friend Ilena was raving about gladiator sandals being the next big thing. Loved the styling work done by Uncle Karl (wayyy cooler than Uncle Sam! Jokes. I love you Amuhricahhh). As you can see, fashion comes and goes, 5 years ago this was the fad, and now 5 years down the road, black fedora hats and knee-high gladiators are back again! So that was my first impression of these hotties. My second encounter with these fish-net looking black summer staple was when a customer came into work yesterday with these EXACT PAIR OF SHOES ON. Needless to say I rushed to serve this beautiful lady with a sense of elegant taste, hoping to learn from her a thing or two about style (a maybe sneakily about the shoes as well). That's when I found out they sell these at DJs! I was literally over the moon, because I get to try them on before I buy them!